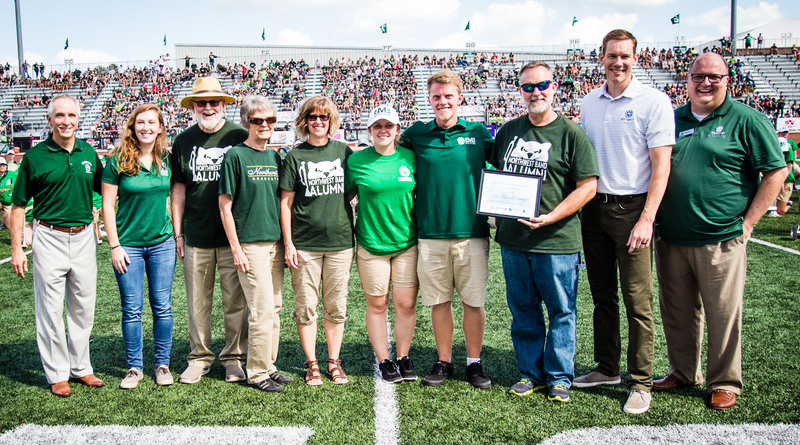 The Hascall family, of Kansas City, Missouri, is Northwest Missouri State University’s 2018 Family of the Year, a recognition bestowed each fall during the University’s Family Weekend festivities. Sponsored by Campus Dining, the Family of the Year recognition comes with a $750 scholarship and other prizes. The family was introduced during halftime of Saturday’s Family Weekend football game. The family, which now spans three generations of success in music education and music performance, includes Kaleb Hascall, a senior instrumental music education major, and Tori, a freshman mass media major with an emphasis in broadcast production. Both also are members of the Bearcat Marching Band. They are the children of Ky Hascall, a 1991 Northwest graduate, and Vikki Watts Hascall, a 1993 Northwest graduate. Ky’s parents, who also were present Saturday, are Harold, a 1968 graduate, and Carol, who worked in Northwest’s registrar’s office. Harold and Carol Hascall’s daughter, Dawn Hascall Holt, earned her bachelor’s degree in education from Northwest in 1994 and added a master’s degree in 2000. Harold, who spent 31 years as a band director in Iowa schools, said he decided to pursue his degree in music education at Northwest because his brother, Edwin, a 1955 graduate, had a positive experience at the institution. Harold was intent on becoming a music teacher, and returned to Northwest in 2016 to be conductor of the Northwest alumni band. “I just loved playing my instrument when I was a young boy, and I just had to keep going and I passed it down to the kids,” he said. Ky was born in Maryville while Harold was attending Northwest and has gone on to a successful career in music education also. As director of bands at Park Hill High School in Kansas City and a music composer, he has been a strong supporter of Northwest’s instrumental music programs, often bringing his high school students to attend Northwest musical programs and visit days. He also is active with the Alumni Band, loans equipment to Northwest, hosts visiting Northwest ensembles and welcomes student-teachers into his classroom. “It’s the community, the attitude with everyone on campus. It’s just such a great family atmosphere,” Ky said of Northwest. Kaleb was honored in 2015 as the Bearcat Marching Band’s New Member of the Year and serves as a drumline captain. He also is active in the Northwest orchestra, wind symphony and percussion ensemble. In addition, Kaleb has been selected to participate in several professional and competitive performance groups as a Northwest student, including the St. Joseph Symphony, the Missouri All-Collegiate Orchestra, the Missouri All-Collegiate Percussion Ensemble and the Troopers Drum and Bugle Corps. This summer he was a member of the Santa Clara Vanguard Drum and Bugle Corps, which won the Drum Corps International World Championship. Although Tori is just a few weeks into her tenure as a Northwest student, she already is seeing why her family takes so much pride in the University. Dr. Katy Strickland, the chair of the Department of Fine and Performing Arts and the director of athletic bands at Northwest, nominated the Hascall family for the honor in recognition of their involvement with the University and for exemplifying what it means to be a Northwest family. Each fall, Family of the Year recipients are self-nominated or nominated by members of the Northwest community. Applicants are judged on the family's commitment to Northwest, academic success, service and the family’s consistent and sustained involvement over several generations.